Maori is a tile-laying family game which can be lazily grouped with its more famous cousin Carcassonne – but in truth Günter Burkhardt’s design is quite a different beast. A game only takes about 45 minutes and it works well at all of its player counts, from 2-5 players. Released in 2009 the game is (at time of writing) currently out of print, but easily available – usually reasonably priced at below £30 – on the secondhand market. It’s a relatively light game in terms of rules, suitable for ages 8+, but a host of variants (included in the rules) create a more challenging experience for hardened players. 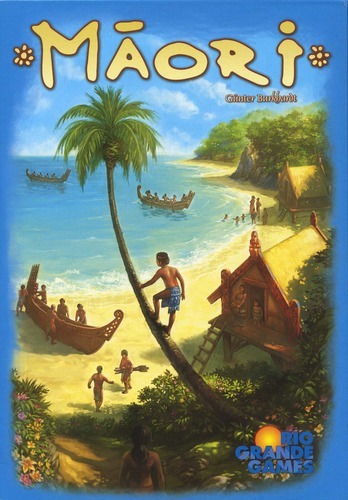 While you shouldn’t expect a thematic experience (this is very much an abstract game, in a similar way to Carcassonne, but set in Polynesia) you can expect lovely art from Harald Lieske and Michael Menzel that make the game look great on the table (it has 97 quality cardboard tiles, five double-sided player boards and 36 wooden pieces). In a basic game of Maori, each player has a board with 16 spaces for tiles. Once one player has filled their board, the round ends and the game is scored. In the centre of the table is a 4×4 grid of face up, randomly drawn tiles. A boat piece is placed on the edge of the grid next to one of tiles. On a player’s turn they move the boat a number of spaces and then (usually) take a tile, placing it on their player board. The maximum amount of spaces you can move is dictated by the number of ships on your board (you start with two), but this number can be boosted by spending shells (you start with five). You take the tile you finish next to – or you can also spend shells to take a tile further into the grid from your position. The tile you take needs to match exactly when you place it on your board; and unlike a game such as Carcassonne, most of the more useful tiles (that will give you points or shells) need to be placed the right way up (any shells are taken immediately). In the latter stages of the game you may come unstuck, being unable to use the tiles you can get to. In this case you still have to move the boat, but can do a less efficient action such as placing a tile in your reserve for later use, or ditch one already on your board. At the end of the game, any unfinished islands on your board are removed – and you then lose one point per empty space on your board. Completed islands score one point per tree on them, or two per tree if they also include a hut. Completed leis (the flower circles) score 10 points (these are the only things in the game that don’t need to match up when placing tiles), while there are bonus points for the players who have the most shells left and the most boats on their tiles. The writer: Maori was part of a golden era for lighter euro games, but sadly for many newer gamers it and many others have been lost in time. There’s real design elegance here, and loads of interesting choices, in a game that lasts well under an hour. Simple to teach, easy to pick up and good to look at, but with layers of hidden depth to challenge even the smartest gamer. A true classic that, for me, blows Carcassonne out of the water by being tighter and more interesting. The thinker: I soon tired of the base game, but that is just the beginning of what Maori has to offer. Each player can optionally take another ship, this time used on their player board. After they place their first tile this ship is put on it, and subsequent tiles laid must be in a square adjacent to it. There are two options: the player can move the ship as they choose at the end of their turn, or for a harder option they have to place it on the tile just taken. Both offer a much stiffer challenge, while really opening up opportunities for other players to leave you in bad positions for tile selection. The player boards are also double-sided, with a more challenging larger board on the reverse. The trasher: While Maori may look like an innocent euro, much like Carcassonne there are some key ways to screw with your opponents. Especially with two players you can try to control the board, limiting your opponent’s ability to get the pieces they need – or starving them of shells and ships. There are also several volcano tiles, which you can’t use shells to take tiles beyond. If these come out (you can of course make sure you have them in the initial set up, if you want to) they add an extra wrinkle, and tactical element, in terms of the main tile grid. The dabbler: While I prefer the simplest version of the game (the others fry my brain! ), I do love the look, simplicity and length of Maori: the colours are so vibrant. I tend to play it quite friendly, not worrying too much about what the next player is going to pick up. Especially with four players, it feels hard to really plan ahead as the boat will have moved so far before your next go – but if the player to your right is mean, you can have a really rough time playing this one! As always, you just need to play with the right people. With a Board Game Geek rating of 6.6 and a ranking of 1,665 (at the time of writing), it’s clear not everyone is as excited about Maori as I am – but I think it’s fair to say average scores have become more generous in recent years (so older games, ranked earlier, suffer). Some have listed luck as being a problem with the game, some even saying it is worse than Carcassonne in this respect. I can only imagine the majority of these opinions were made after a single play, as a good player will beat a poor one in almost every game of Maori – that’s not luck. As in all good games, here you very much make your own. Sure, sometimes you’ll have a bad game and someone else a lucky one, but this is a 30 minute tile-layer. Surely that’s par for the course? Some also bemoan the limited variety in tiles, and the lack of flexibility in what you can do with them. While I guess this is a valid complaint from those who like a million options, it is missing the beauty here: the constraints are all part of what is a clever puzzle of a game. You only want so much to think about – it’s not an engine-builder. Finally, there are several complaints about a poor set of tiles in the 4×4 grid leading to boring decisions and, consequently, a poor experience. I can honestly say I haven’t seen this happen often, and when it does it tends to be a phase of the game – not for the whole thing. And while yes, it can be frustrating, it’s just a different problem to deal with: I’d be surprised if, over several games, many saw this as a deal-breaker – and it’s sad if, on a one-ff play, this had put some people off playing it further. I first learnt to play Maori back in 2011 and have been enjoying the game (both on the table and online at Yucata) ever since. I always find it a solid hit with more casual gamers, while several of my most gamery friends also list in their favourites lists. It proved to be one of the first games my partner Sarah fell for, giving it a new lease of life on our table last year, but it has been on my Top 5 games lists since I started them in 2014: so I figured I should get around to giving it the love it deserves. It’s one of those simple, smart games I can never see myself getting rid of and that I’m always happy to play if requested – while often turning to it for newer gamers as well. This entry was posted in Board games, Games and tagged boardgame reviews by Chris Marling. Bookmark the permalink.